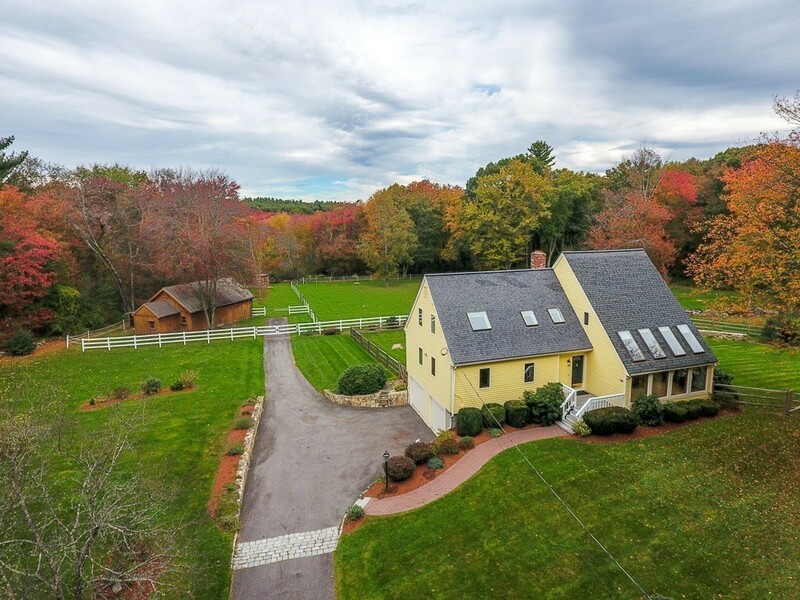 Less than 30 miles from Cambridge and Boston, this spectacular home is in an idyllic setting and includes 5 acres with professionally landscaped stone walls, a fenced area for the dog and a barn and paddock for the horses. Enjoy cooking in the open concept kitchen and breakfast bar complete with brand new appliances. Throw some logs into the fireplace and enjoy a wood fire. Step out onto the screened porch on those warm evenings and enjoy nature without the mosquitos. Want some quiet time? Step into the living room/den and enjoy a movie or the game. There is also an office on the main level, a guest bedroom and a full bath. Upstairs is the master bedroom and bath with lots of closet space, a laundry room and 2 more bedrooms and a 3rd full bath. The basement features a finished play/game room and lots of storage. The barn has 3 stalls, a tack room, heated water and hay storage. Fantastic Acton/Boxborough school system. A rare find indeed!